For more than three decades in the making, the Spektr project envisioned a series of space observatories, which would "divide" between themselves a huge swath of the electromagnetic spectrum from radio waves to ultraviolet light and to X-rays. The program resembled NASA's plans for a quartet of "great observatories," including an optical telescope, later known as Hubble; a gamma-ray observatory, GRO (later Compton); an X-ray telescope, AXAF (or Chandra) and an infrared observatory, SIRTF (later Spitzer). While all US "great observatories" made it to orbit between 1990 and 2003, the Spektr series remained grounded by the economic cataclysms of the post-Soviet period. Roots of the Spektr program go all the way back to the beginning of the 1980s, when NPO Lavochkin design bureau, USSR's prime developer of scientific space probes, completed the preliminary design of a new-generation spacecraft dubbed 1F and 2F. 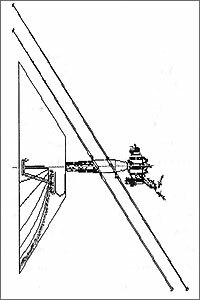 Although the primary purpose of the project was the development of a standard platform for various deep-space missions, Lavochkin also hoped to use the 1F design as the basis for space telescopes. 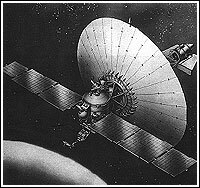 In 1982, the design bureau completed technical proposals for a space-based radio telescope designated Radioastron. 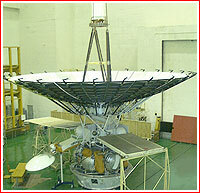 Since the spacecraft was expected to follow the Soviet Astron mission, the new project was also known as Astron-2 (2A). Radioastron was expected to carry a radio antenna with an impressive diameter of 10 meters. 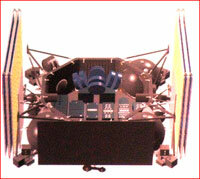 Very early on, critics pointed out that the 1F platform was ill-suited for astrophysics missions, even in comparison to the older 4V spacecraft bus. The attitude control system of the new spacecraft could easily navigate planetary probes, however its accuracy would be way below typical requirements for a high-precision telescope. In addition, the spacecraft lacked either electrically driven fly-wheels, which drastically improve the stabilization in space, or movable solar panels, which could track the Sun without the need to reposition the entire satellite disrupting observations in the process. On July 27 and Aug. 2, 1983, the presidium of the Academy of Sciences reviewed and made a decision to launch Astron Radio spacecraft in 1987 or 1988, which would be able to register electromagnetic radiation in the centimeter range of the spectrum. According to the same decision, in 1990, it would be followed by a more complex Astron spacecraft capable of capturing radiation in the millimeter range. On Aug. 1, 1983, the Military Industrial Commission, VPK, issued official decision No. 274 entitled "On works for creation of automated interplanetary vehicles for the exploration of planets of the Solar System, the Moon and cosmic space." The document provided a new impetus for the development of astrophysics satellites. 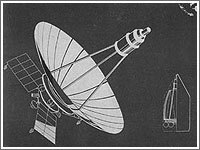 New technical proposals issued in mid-1984 included a spacecraft with a gamma-ray telescope designated 2AG and the 2AM spacecraft with an antenna for registering millimeter-range radio waves. Both satellites now sported rotating solar panels, fly-wheels and a highly sensitive star-tracking orientation system. Initially, NPO Lavochkin subcontracted the development of the critical attitude control system for the spacecraft to a division of NIIAP, a leading Soviet avionics producer led by Nikolai Pilyugin. However in the following five years this assignment had to be transferred to the main office of NIIAP and then back to its branch. With the federal funding collapsing at the beginning of the 1990s, all scarce resources of the Russian space science budget were directed toward the long-delayed Mars-94 project (later renamed Mars-96). Following its tragic loss in November 1996, it was decided to switch future scientific priorities toward the Spektr observatories, with Spektr-RG first in line to fly. All three Spektr missions were being prepared under an umbrella of multilateral international agreements. By 1997, international teams produced test prototypes and some flight versions of scientific payloads for the Spektr-RG and Spektr-R missions with a total development price tag of $200 million. Despite all the international involvement and its status of the highest priority mission, Spektr-RG never had a chance to reach the launch pad during the 1990s due to severe underfunding. By 2002, as the scientific goals of Spektr-RG were about to be matched and eclipsed by the Europe's Integral observatory, even Russian astrophysicists lost interest in the project. On Feb. 13, 2002, the Russian Academy of Sciences decided to switch its funding priority to the Radioastron mission. Its launch was then timed for 2004-2006, or no later than 2007, to beat similar US and Japanese missions, which were anticipated in 2008. Facing a decade-long delay of the mission, NPO Lavochkin had to replace a number of critical avionics which were intended for the Spektr series. 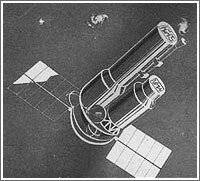 Previously, developers hoped to use backup radio systems left over from the Mars-96 and Interbol missions on the two first Spektr satellites. However, with the new launch dates, these sensitive avionics would far exceed their warranty for reliable operation. In the post-Soviet turmoil, the manufacturing of duplicate units was no longer feasible. As a result, in 2001, NPO Lavochkin subcontracted the development of a brand-new communication system to OKB MEI. The telemetry system and the flight control computer, which had previously flown onboard the Kupon communications satellite and the Arkon-1 reconnaissance satellite, were to be supplied respectively by the Izhevsk Radio Plant and by a design bureau in Zelenograd.